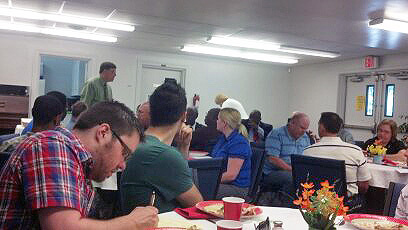 Clarksville, TN – On May 17th, 2012 the Clarksville Area Ministerial Association (CAMA) held its final luncheon meeting until fall. After prayer and a hearty meal prepared by Hilldale UMC volunteers, the meeting began with a treasurer’s report and updates about the new officers for CAMA that will begin their appointed roles concluding the summer break. CMCSS System Director Mike Harris speaks at the luncheon. The Buffalo Soldiers Motorcycle Club is at it again! 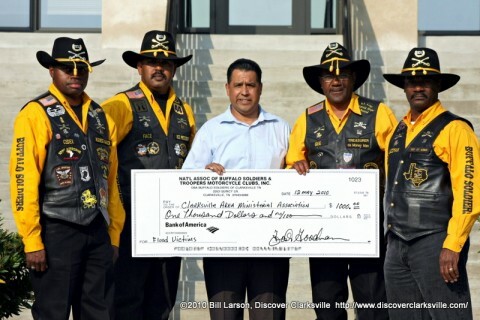 The Buffalo Soldiers Motorcycle Club of Clarksville, TN helped our community yesterday by making a donation of $1000.00 to the Clarksville Area Ministerial Association (CAMA) to provide help to flood victims. The donation will allow CAMA to purchase much needed supplies to deliver to those affected by the flood. The Buffalo Soldiers Motorcycle Club recently returned home from attending their annual frontier meeting in Oklahoma City, a 1400 mile bike ride. Along the way, they and saw first hand the damage created by the Great Flood of 2010. The Buffalo Soldier's Motorcycle Club presents a $1000.00 check to CAMA representative Pastor Tommy Vallejos to help flood victims. (Left to Right are: Business Manager Cedric "Cedix" Reid, Vice President Faisal "Face" Alim, Pastor Tommy Vallejos, Treasure Foster "Gee" Goodman, and Carl "Jazzman" Little).